Original - Used - Boxed ---. 3 magazines supporting Amiga range. Lots of nostalgia and great info. STEEL SKY. COMMODORE AMIGA 32 CD. This is Beneath a Steel Sky for the Commodore Amiga CD 32. Disc is in good condition and in full working order. Condition is Acceptable. See Photos. Case/Box: Acceptable - Box has Warped as shown in Photo. In Full Working Order. Disc: Very Good. F1 GP Circuits by Idea. The best condition. We view excellent as between 8-10/10. We'd view Fair between 3-4/10, and tatty 1-3/10. We view VG as between 6-7/10. Really 'Good' is average, we'd view G as between 4.5-6/10. Microcosm amiga cd32 bit game Good condition & loaded fine last time it was used Smoke & pet free home U.k bidders only Payment with PayPal within 48hrs of auction end Proof of post is always obtained Thanks For looking!! The Commodore CDTV is a region free console, you can use this software on any CDTV anywhere in the world. The best condition. We view excellent as between 8-10/10. Just because the manual isn't photographed, if listed as complete, it will be included. Genre: Action Adventure. Region Information Key. James pond 2 robocod amiga cd32 bit game Good condition & loaded fine last time it was used Manual a bit ripped on the back (see pic 2) Smoke & pet free home U.k bidders only Payment with PayPal within 48hrs of auction end Proof of post is always obtained Thanks For looking!! Arabian nights amiga cd32 bit game Good condition & loaded fine last time it was used Smoke & pet free home U.k bidders only Payment with PayPal within 48hrs of auction end Proof of post is always obtained Thanks For looking!! Pre owned fully working Missing One Disk. Thrill Time: Platinum 2 is a collection of eight games. ---Battleships ---Beyond the Ice Palace ---Bomb Jack ---Buggy Boy ---Live and Let Die ---Thundercats ---Space Harrier ---Ikari Warriors System / Commodore Amiga Region / PAL Developer / Elite Systems Ltd. Players / 1 Condition All of our items are cleaned and thoroughly tested. Box is in great condition with some edge wear damage and denting. Disks are in excellent condition. Compatible: Amiga 512k. The box has sticker residue to the front, slight bowing to the rear and shelf wear to the rear. 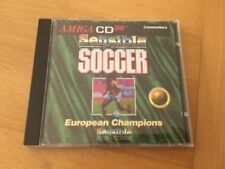 ORIGINAL AMIGA CD / AMIGA CD32 ITEM. In Full Working Order. Disc: Very Good. Case/Box: Good. USED AMIGA THUNDERHAWK GAME FROM CORE DESIGN LIMITED BIGBOX ON 3 1/2" DISK . Deluxepaint Amiga Floppy. Condition is Very Good. Dispatched with Royal Mail 1st Class Large Letter. This is the first release of Dan Slivas Deluxepaint. This disk is super RARE. I have yet to see another on eBay. Good Condition and Working Great. Commodore Amiga CD32. Microcosm featured realistic FMV animation, with the graphics being rendered on Silicon Graphics workstations. Fully working. Hi, for sale is The Clue for the Commodore Amiga CD32. 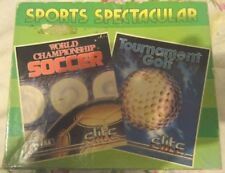 This is the very rare big box version of the game that does not appear on eBay very often, if at all! As you can see from the pictures, this is a very good example that has been well looked after, it has the very thick, full English instructions. I have tested it and loads up fine as can be seen from the game screenshot. The corners of the box are a little scuffed but it is still a really fine example. This item will be sent Royal Mail 2nd class Signed for with free postage. I will send to any UK address and the eBay global shipping centre. If you would like your item posted directly to your country, please message me and I will quote a delivery charge. 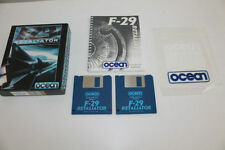 Please view my other CD32 items. THE RUSSIAN FRONT IN WORLD WAR II. I PLAYED THIS FOR HUNDREDS OF HOURS IN THE 1990s. Also I have included for free is a Amiga Action Magazine Christmas 1994 Cheat Disk. ALL OTHER INFORMATION. Operations Guide. Genre: Sports / Snooker. Instruction Book. Power Drive. Good Condition and Working Great. The Commodore CDTV is a region free console, you can use this software on any CDTV anywhere in the world. Complete in Excellent condition. Disc 9/10. Any faults are written alongside the condition above, for example if there was a tear in the sleeve, writing on the label, or missing instructions, then these should be written after our condition. Dizzy The Big 6 - Commodore Amiga CD32. Condition is Like New. Dispatched with Royal Mail 1st Class Signed For. One of gaming's true legends stars in six of his biggest adventures! Join Dizzy as he jumps and puzzles his way through the following games: Magicland Dizzy Dizzy Prince Of The Yolk Folk Treasure Island Dizzy Spellbound Dizzy Fantastic Dizzy Crystal Kingdom Dizzy This is a rare game, and it is in amazing condition. No flaws to tell. Would make a fine addition to any CD32 collection. Oscar/Diggers by Millenium Interactive For The Commodore Amiga Cd32 very rare.